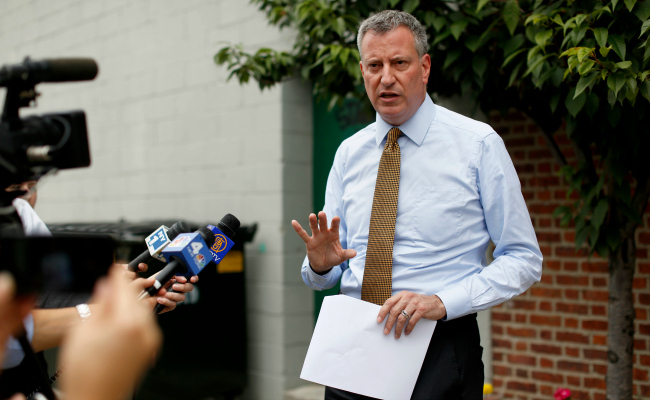 Just How 'Tired' Is Bill de Blasio's '2 Cities' Message? It's not just Dickens. You can trace the New York mayoral frontrunner's fiery call to arms right back to one of the most famous speeches of the 19th century. Bill de Blasio, the public advocate for New York City, is on the cusp of being its next Democratic nominee for mayor, and his critics can't decide if his message is going to plunge New York back into the 1970s and take it to "the brink of bankruptcy and rampant civic decay," as Republican mayoral nominee Joe Lhota warned, or usher in a new era of "class warfare," as Mayor Michael Bloomberg recently worried. The one thing people seem to agree on is that de Blasio's mantra about "a tale of two cities" is something they have heard before. Even impartial New York Times reporter Michael Barbaro called it "a tired-seeming message" before acknowledging that it surprisingly resonated with "people still hurting after a traumatic economic recession." Which raises the question: Just how tired is it? I tweeted back and forth about it with Democracy: A Journal of Ideas founders Andrei Cherney and Kenneth Baer, both also former White House speechwriters. I'd been hearing resonances of John Edwards's 2003-2004 stump speech about the "two Americas" in de Blasio's lines, which made a lot of sense as de Blasio was in 2003 a top New York state strategist for the would-be presidential contender. Baer said it went back further than that, to Mario Cuomo's 1984 Democratic National Convention speech, which was an influence on Edwards, and Cherney countered with William Jennings Bryan's legendary "Cross of Gold" speech from 1896, as the progenitor of the populist strain in Democratic Party politics. And then there is of course the most obvious and direct reference point, from the title of Charles Dickens's 1859 A Tale of Two Cities, a novel about an actual war between the classes during the French Revolution. The intellectual history of the language of class conflict is so broad a topic books can and have been written on it, but, in short-form, here's some of the background to those famous new old words of Bill de Blasio. Bill de Blasio, on the stump in New York, August 20, 2013. When I say all over the city we are living the tale of two cities, all you have to do is come right here and see that a family can be threatened by -- it could be mold, it could be vermin, it could be a door that doesn't lock -- and the City of New York through the Housing Authority can take a year or more to address it while meanwhile not far away in the city there are people living in multimillion dollar condos. If that's not a tale of two cities I don't know what is. And it's unacceptable. It's not how we should treat our citizens. John Edwards, December 29, 2003. We cannot go on as two nations, one favored, the other forgotten. It is wrong to reward those who don't have to work at the expense of those who do. If we want America to be a growing, thriving democracy, with the greatest work ethic and the strongest middle class on earth, we must choose a different path. Mario Cuomo, Democratic National Convention Keynote, July 16, 1984. ... the hard truth is that not everyone is sharing in this city's splendor and glory. A shining city is perhaps all the President sees from the portico of the White House and the veranda of his ranch, where everyone seems to be doing well. But there's another city; there's another part to the shining city; the part where some people can't pay their mortgages, and most young people can't afford one; where students can't afford the education they need, and middle-class parents watch the dreams they hold for their children evaporate. William Jennings Bryan, "Cross of Gold" speech, 1896. ... My friends, the question we are to decide is: Upon which side will the Democratic party fight; upon the side of "the idle holders of idle capital" or upon the side of "the struggling masses"? That is the question which the party must answer first, and then it must be answered by each individual hereafter. The sympathies of the Democratic party, as shown by the platform, are on the side of the struggling masses who have ever been the foundation of the Democratic party. There are two ideas of government. There are those who believe that if you will only legislate to make the well-to-do prosperous, their prosperity will leak through on those below. The Democratic idea, however, has been that if you legislate to make the masses prosperous, their prosperity will find its way up through every class which rests upon them. Come to think of it, Bryan's description of what we today call trickle-down economics was pretty well-restated by Bloomberg, who told New York magazine, "The way to help those who are less fortunate is, number one, to attract more very fortunate people. They are the ones that pay the bills."